We first discovered excellent chilaquiles when we were in Playa del Carmen last year. When we returned home, I immediately started whipping up delicious batches of chilaquiles using salsa verde and corn tortillas. It wasn’t until a few weeks ago, in an effort to “stretch” our groceries (saving for that honeymoon!) that I used up the rest of a bag of flour tortillas and a bottle of red salsa we’d used in my famous Crockpot chicken tacos that we rediscovered the absolute glory and versatility of chilaquiles. 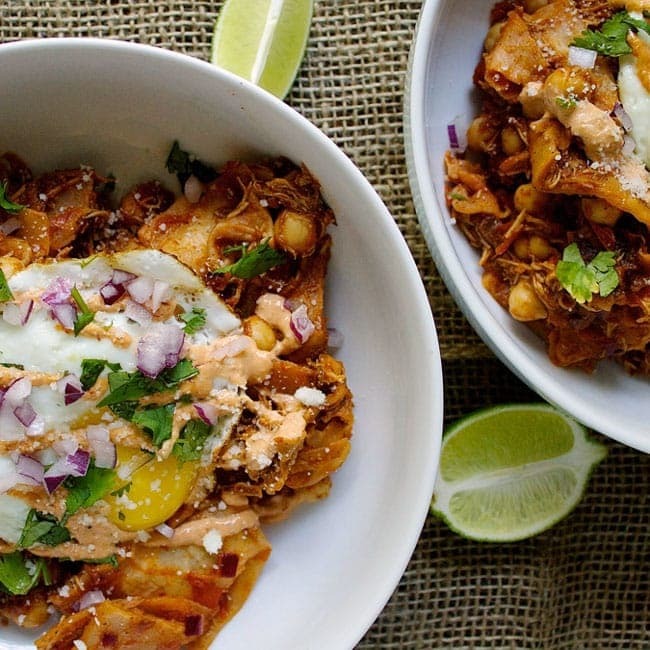 Chilaquiles is essentially a tortilla and salsa casserole, making use of ideally stale tortillas and whatever-else-is-on-hand. We saved a bit of the Crockpot chicken taco meat and threw it in the chilaquiles batch, along with about 2/3 of a can of garbanzo beans, because, well, that’s what we had on hand. We’ve used pinto beans, veggies, you name it. It’s a pretty sturdy everything-but-the-kitchen-sink recipe, an excellent way to use up what you might waste in a most delicious recipe. Topped with a fried egg, the richness of the egg yolk is positively delicious and adds an elegance to this Mexican comfort food. 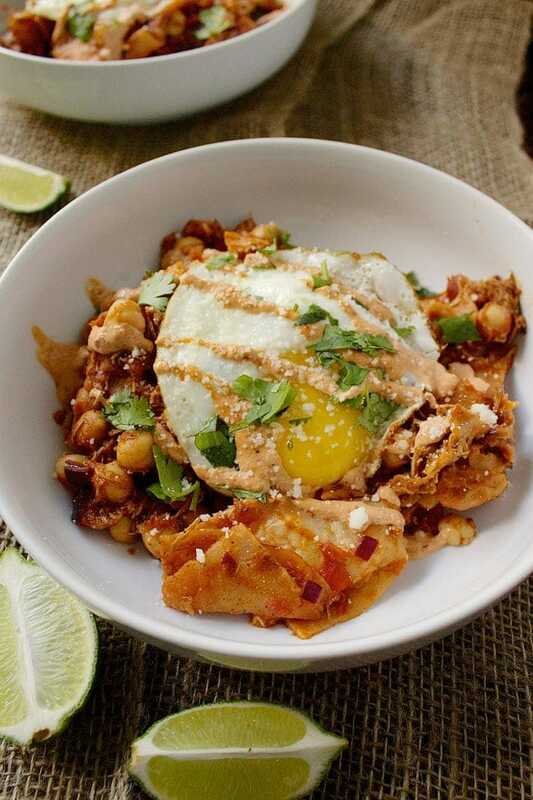 The chipotle pepper infuses the chilaquiles with a delicate smokiness and a nice spicy touch. The acidity of the tomatoes marries beautifully with the creaminess of the tortillas, all balanced by the richness of the creamy egg yolk. Using flour tortillas lends the dish a certain richness that you miss when you use the more textured corn tortillas. Both are excellent, but the smooth sweetness of the flour tortillas was certainly a treat for us this go-round. 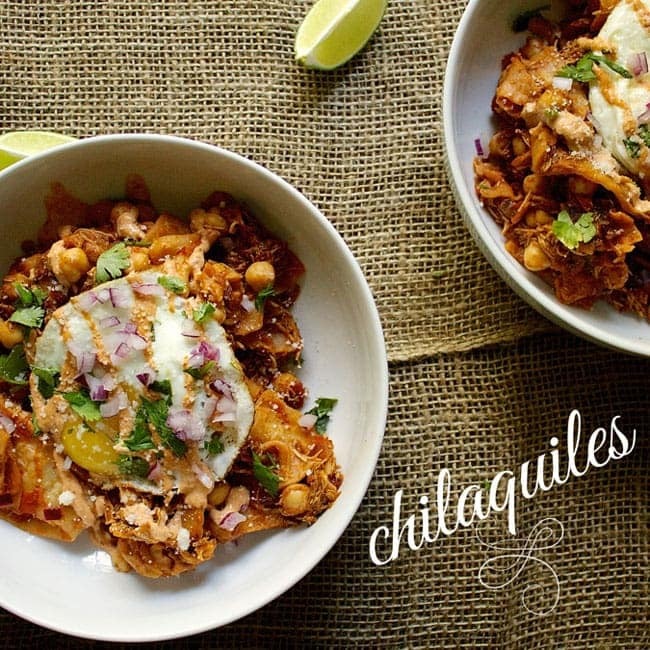 We top our chilaquiles with cheese (duh), chiopotle aïoli (duh), and cilantro and onions. It’s authentic enough that you’d look pretty fancy serving it to your friends, but it’s so, so easy and forgiving. Did I mention cheap? It’s cheap. It’s super cheap.